The second of the Navy’s next-generation patrol ships makes her debut at sea next month – as the fourth ship entered the water for the first time. HMS Tamar became the latest second-generation River-class ship to be officially launched, lowered into the water at BAE System’s Govan yard, then towed three kilometres downstream to the firm’s Scotstoun facility, where fitting out takes place. There she joins Ship No.3 in the class, HMS Trent, and No.2, HMS Medway, which are both being fitted out. Medway is days away from completion. She is due to head down Glasgow’s great artery for her maiden voyage in November. A mixed Royal Navy-civilian crew will put the 2,000-tonne vessel through her paces off the west coast of Scotland after months of training and preparation. As well as getting used to a new ship fitted with new equipment, the crew – who are split between Portsmouth (warfare/logistics) and the Clyde (weapons/marine engineers) – have been breathing life into the Medway name, visiting the Scottish Legion in Glasgow and the city’s RNR unit Dalriada, and trying their hand at curling and clay pigeon shooting. The Borough of Medway will be the ship’s affiliate throughout her lifespan and sailors are due to attend a council meeting early in 2019 when the Freedom of the Borough will be bestowed on the vessel. Despite not being at sea yet – or having raised the White Ensign – the traditions of the Service remain vitally important to Medway’s ethos, from toasting the birth of Prince Louis to recognising stalwarts of the ship’s company, such as communications expert Leading Engineering Technician Paul Guy. He’s clocked up 25 years of unblemished service in the Royal Navy – a milestone recognised with a bar to his Long Service and Good Conduct Medal. It was presented not only by his Commanding Officer Lt Cdr Hugh Harris but also by comedian and Phoenix Nights’ Ted Robbins – aka Peter Kay’s arch rival Den Perry. If the sea trials run as planned, Medway should move to Portsmouth early in the new year. “We on HMS Medway are extremely excited for the challenges ahead and the imminent sea trials – and subsequent first entry into Portsmouth,” said Lt Cdr Harris. By then, HMS Forth – the lead ship in the second generation of River-class vessels – should be back at sea. Problems with her have kept Forth in Portsmouth throughout the summer of 2018, but following rectifications by BAE, her crew are expected to move back on board in November with trials resuming in the second half of January. The final ship in the class, HMS Spey, is due for launch. 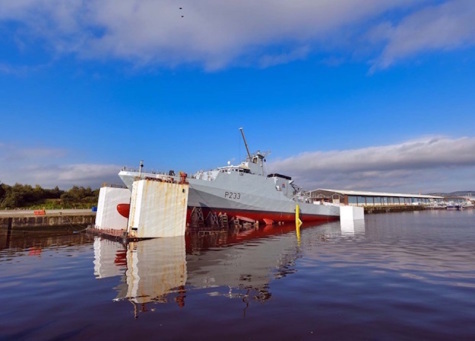 All five vessels will perform a mixture of fishery protection work and general maritime security duties in home waters – with the ability, like their first batch of Rivers, to conduct overseas patrol missions as well.